Check us out on Facebook for information about New Beer Releases and Beers on tap! The original cream ale was brewed to compete with the Pilsner during a time when it was difficult to cold ferment beers. At DuVig, we brew our Cream Ale to have a slight malt flavor with a nice crispness that is accented with American hops added for flavor and aroma, not bitterness. The hops used in the DuVig Cream Ale produce a harmony of flowers, fruit, earth and spice. 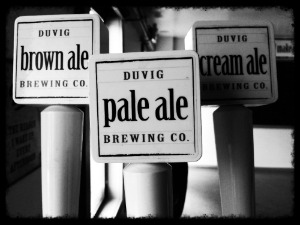 DuVig’s Cream Ale is a thirst quencher and is best served at cold temperatures (35-40 degrees). This beer is brewed to have hints of rose and chocolate. These flavors come from dark roasted malts used sparingly to produce a Brown Ale with flavors such as carmel, toffee and biscuits. The yeast used to ferment DuVig’s Brown Ale adds traces of fruity flavors and aromas such as plums, raisins, or ripe apples. These rich, dark flavors are most apparent at 42-45 degrees. This is a classic beer brewed to perfection. All the flavors and sensations expected from an American Pale Ale are delivered in DuVig’s Pale Ale. This beer is partially filtered with a pure white head. DuVig’s Pale Ale has a wonderful bouquet of aromas and flavors. Let the beer roll over your tongue for a few minutes and will taste citrus, mango, pineapple, grapefruit and many other flavors. The flavors can actually change as the temperature of the beer changes. DuVig’s Pale Ale is best enjoyed at 40-45 degrees. The Scottish Ale is a malty, clean beer with little to no hops flavor. The beer was originally sold based on shillings (60/-, 70/-, and 80/-), and of course the Wee Heavy. This antiquated way of rating and selling the beer is no longer used, but the descriptions are still used to distinguish the versions of the beer. The Scottish or Scotch ale is a ‘darkish’ brew that originated on the British Isles. It is a malty beer defined by its smooth slightly caramel sweetness that is achieved by a lengthy boil. The selection of ingredients and the brewing process are probably more significant determinants for Scottish beers than are their statistical profiles. The DuVig version of this beer is brewed with traditional ingredients using the best brewing process to make a classic version of this style. The DuVig Scottish Ale 60/- has a deep copper hue and a rich malt taste with a clean finish. Double the hops, double the malt and double the alcohol, this beer is all about balance. The goal was to produce a beer where flavors of tropical fruit, melon and citrus take center stage while lingering hop bitterness and malt sweetness round out the flavor. And did we mention no alcoholic bite? The Moxie Ale is a unique beer developed by DuVig Brewing Company in collaboration with Moxie Bar and Restaurant. DuVig Brewing Company brews this unique Amber Ale specifically for Moxie. This style of beer is called a Red Ale in some regions and Amber Ale in others. While there is ambiguity, people are beginning to think of the two as different sub-styles. The beer is more in style with the Amber Ale because it is a gentler, more malt-focused beer with an even balance of malt and hops. The rich malt flavors have pronounced caramel laced with rich, dark grain flavors that are refreshing but not sweet. The malt body is gently accented with light bitterness and just a touch of citrus that finished crisp and clean. The beer can be consumed as a thirst quencher at cold temperatures (35-38 F) or as a rich sipping beer at warmer temperatures (45-50 F). The Stout is often misunderstood because of the many versions of the style and its similarities with the Porter. Throughout history, breweries have made sweet stouts (Milk Stouts) using lactose, a dry stout, and an Oatmeal Stout; which lands in the middle of the flavor profile. The Stout is usually considered the first beer made from a grain bill that is used again to brew a Porter. The DuVig Oatmeal Stout is an extremely complex beer brewed with various dark grains used in proportion to create a silky smooth experience. The chocolate taste comes from chocolate malt, the roasted taste comes from roasted barley, and the hints of caramel come from crystal or caramel malts. Typically, oatmeal stouts do not specifically taste of oats. However, the oats impart the well-known smoothness. The DuVig’s Oatmeal Stout is not a heavy beer, but is flavorful and smooth with a nice dry finish. Our Oatmeal Stout will deliver the most flavor when consumed at 48-52 degrees. Bock beer has a long history filled with interesting stories and origin details that require the individual to decide what is most likely true. The beer originated in Einbeck, Germany in the 14th century and was a favorite brew during Germanic Catholic festivals. There are several sub styles of Bock beer made throughout the world. DuVig Brewing Company’s Bock is a traditional style -- a rich malty lager of fairly high strength at 6.2% ABV. This range of alcohol is appropriate for a Bock, but is considered high for most other Lagers. The beer is brewed with a complex grain bill including many sweet malts that carry through to the finished beer. While the beer is not cloying, the rich malt has some caramel and toasted bread flavors. The fermentation is kept clean with a lager yeast so there are no fruit flavors and no detectable hops. The pleasant bite on the pallet comes from dark roasted malts. The beer is best consumed at cellar temperatures of 45-50 degrees. The birth of Pilsner beer can be traced back to its namesake, the ancient city of Plzen (or Pilsen), which is situated in the western half of the former Czechoslovakia (now the Czech Republic). The beer is traditionally brewed with soft water, fermented cold and stored cold. The Pilsner is a general term to describe a lager beer that has grainy mouth feel and flavor, along with spicy hop bitterness. The category of Pilsner beer has some overlap with traditional American Lagers and other light beers, but a well-made Pilsner is immediately identifiable by the flavors and the refreshing clean fermentation. The DuVig Pilsner is modeled after a Czech Pilsner. The beer is complex with a nice rich malt flavor and strong spicy hop profile with moderate bitterness. As is traditional for this style, the beer is brewed with soft water (this is the first brew at DuVig that did not have mineral and salt additions in the water) using one grain and one hop. This is commonly referred to as a Single Malt and Single Hop (SMASH) beer. Despite only have two ingredients, the beer is extremely complex and flavorful. The chosen hop and grain deliver an exciting flavor profile. This beer is only 4.2% ABV and is great consumed very cold (35 F) or a little warmer (45 F) if you want to fully experience the hop flavors. Under German law, this style of beer can only be called a Berliner Weisse if it is brewed inside the city limits of Berlin, Germany. But since the process, rather than location, defines the style, DuVig is not taking undue liberty in the name of this tart beer. DuVig uses a traditional mash process involving lactobacillus that is naturally on wheat. After a full temperature mash-in, cool water is added with more grain to create the ideal temperature for lactobacillus to get to work. The mash is held at this optimum temperature for three days before finishing the full brew. The beer is crisp and refreshing. As with any traditional Berliner Weisse, this beer has no malt or hop flavors. This clean and sour beer is best served cold and is enjoyable with sweet snacks or dessert. The American Wheat beer is vastly different from a traditional Hefeweizen. Yes, the grains are similar, but the yeast used for each style dramatically changes the flavor profile of the beer. American Wheat has none of the spicy phenols and fruity esters of a Hefeweizen and it often has more hop character as well. The Hefeweizen gets the traditional clove/spice and banana flavors from the yeast and fermentation. The DuVig American Wheat Ale is brewed clean and refreshing. The light bread and biscuit flavors of wheat are readily apparent upfront without any sweet fruit or spice to interfere with a clean finish. The beer is ever-so-slightly tart for a crips and refreshing finish with just enough hops to balance the beer. It is best enjoyed cold, between 40 - 43 degrees. The DuVig Hefeweizen is a traditional Bavarian wheat beer brewed with Wheat and Pilsner Malt and fermented with a traditional Hefeweizen yeast that produces a signature clove and banana character, which is in contrast with DuVig’s American Wheat Ale, whose style lacks these notes. The hops take a back seat in the flavor experiences of this beer, and the low hopping rate allows an underlying grainy, bready flavor for the malts to shine through. It’s a light, approachable beer with a hazy appearance, soft refreshing wheat flavor upfront, best enjoyed at 40-42 degrees, and makes a great hot temperature thirst quencher. There is no denying the popularity of the India Pale Ale style within the craft beer industry; it's difficult to find a craft brewery that doesn't make an IPA and even harder to find one that is not the brewery's best seller. Although the popularity of IPA is clear, the history of the style is not. The rumor and misinformation surrounding this beers lineage has grown in step with it's popularity. One thing we know for certain - the DuVig IPA is brewed to style and has a strong hop bitterness enhanced with lots of hop flavors like pine, earth, melon and citrus. The beer was fermented dry to remove any lingering sweetness from the grain. The hops shine in this beer, with lots of resinous hop flavor that provides a pleasing mouth feel. DuVig's IPA has a pleasant nose which the drinker experiences even before taking the first swallow. The beer is 6.2% ABV and is best enjoyed chilled at 40-43 degrees F.
A local hop grower was gracious enough to give us access to some Cascade and Newport hops he had been growing at The Dudley Farm, in Guilford, CT. We, along with family members and friends, picked these hops ourselves, took them back to the brewery and then brewed a very special pale ale we've named the Dudley Farm Harvest Ale. The hops from the Dudley Farm amounted to approximately 15 pounds. We used 6.5 pounds of Newport hops, a direct descendent of Magnum hops, which have medium high alpha acids that create the potential for a bitter beer; they also provide earth and citrus flavors. Cascade hops, which have been around for a long time and were originally developed by the open pollination of Fuggle hops, are lower in alpha acids than Newport and provide a citrus, floral, and spice flavor profile. We used approximately 8.5 pounds of wet cascade hops in our Harvest Ale. Typically, when a farm grows hops for commercial breweries, the hops are subjected to a laboratory test to give an estimate of certain parameters that help the brewer determine how the beer will taste based on specific brewing practices. Hops grown commercially are also dried and often pelletized. We didn’t dry these hops; this beer was wet-hopped so we were brewing blind. We were dealing with an unknown moisture content and unknown alpha acid levels we had to consider when determining how much to use. After fermentation, we discovered that the Dudley hops blend we used did not provide the necessary flavor (as the hops were used in the boil for bittering) so we added extra Columbia and Summitt dry hops after fermentation to aid in aroma and flavor. While the resulting beer does not have 100% local grown hops, under the circumstances, it is as close as can be. In today’s modern beer world it is easy to mis-interpret the Extra strong/Special Bitter beer style. With the popularity of India Pale Ale (IPA) and Double India Pale Ale (DIPA) one might think this beer is ‘Extra Bitter’, or, more bitter than those beers. This beer style has nothing to do with the IPA and DIPA. A more accurate comparison is the American Pale Ale category. As a matter of style purity, the American Pale Ale has a more pronounced bitterness and hop flavor than the Extra Strong Bitter, but is a close cousin if one is attempting to find an American style similar to the Extra Strong Bitter. The three versions of this beer style are: Standard Bitter, Special/Premium Bitter, and Extra Strong/Special Bitter. The Extra Strong Bitter is an English Pale Ale and is the strongest beer in the English Pale Ale category. You may have seen the term ESB used as an abbreviation of the style. In England, this term belongs to Fuller’s and is not an official term to describe the style. The DuVig version of the Extra Strong Bitter follows the traditional style and has a moderately strong ABV (5.5%) with a midrange of bitterness (50 IBUs). We have brewed this beer to have firm bitterness that does not overpower the traditional malt flavor. The beer strikes a nice balance of a slight bitter bite up front, followed by malt and hop flavor, not more bitterness. The goal was not to produce a big bold American Pale Ale that featured citrus and pine, but rather a malty, slightly spicy, Extra Strong Bitter that finishes dry like all DuVig beers. The extra English Malt used to increase the gravity of the beer (to boost the ABV) adds the nice bready flavors and creates a traditional smoothness. This beer is a great thirst quencher and is best enjoyed above fridge temperatures (40-45 F).